Audrey Myrtle Hodgson, widow of Alan Strathcona Hodgson, QC, died on St Clare of Assisi Day, 11 August. The serenity at the moment of her passing was an exemplar to the power of prayer and the sure presence of a merciful God. Her death was peaceful and she was surrounded by many of her children, grandchildren and her beloved friend Reverend Coleen Lynch. Born in Edmonton, the youngest of three and only daughter to Norman Currie Willson, QC, from Chatham, and Myrtle Willson (nee Bragg) of Bowmanville, Ontario she grew up and received her schooling in Garneau. Throughout her adolescence and into her early adult years she took Royal Conservatory of Music instruction on piano successfully advancing to the highest level. In subsequent years, she maintained a keen interest in music supporting the Edmonton Symphony and the Edmonton Opera. After graduation from University High School in the immediate post-WW II era, she took a Bachelor of Arts Degree with a concentration on French and German. At varsity she was a member of the Delta Gamma Sorority and was active in varsity life. After Alan’s commissioning as an infantry officer in the Canadian Army, they settled into newly married life on his posting to then Battle School at Vernon, British Columbia. In the early 1950’s, they moved to Saskatoon where Alan started his successful career as a cattle buyer. There her life evolved as a young mother and homemaker. She developed an abiding affection for the landscapes and people of Saskatchewan returning there almost annually with Alan and their Corgi. She remained a committed Saskatchewan Roughrider supporter. They returned to Edmonton in 1956. She ran the busy family home in Groat Estates with a loving devotion to her husband and young brood of six, always with the characteristic practical frugality of the era, and an optimistic and cheerful demeanour. When Alan acquired the family ranch and, a few years later, returned to university to read law, her unflagging support of him was a bedrock to his successes. Audrey took much pleasure from her family, life in the country, their dogs and in horticulture. In 1979 she decided to take a two year Library Technician programme at Grant MacEwan College. Always a voracious reader, she subsequently took a creative writing course deriving a sense of accomplishment from the expression of her literary efforts. She relished international travel particularly to Europe, Hawaii and the British Isles. A keen recreational Scottish country dancer, she visited Japan with the Edmonton Scottish Country Dance Society. An enthusiastic golfer, she was a longtime member of the Royal Mayfair Golf Club. Audrey enjoyed company and conversation. She remained, to the end, a loyal, steadfast and true friend regardless of circumstance. She was popular and convivial always showing an interest in others while remaining reticent in talking of her own considerable achievements. Audrey was, in her faith, humble and strong in her belief. 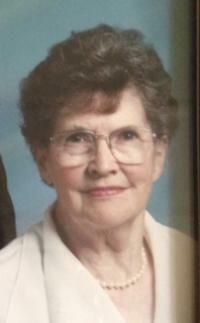 She was an active member of the Anglican Parish of Christ Church for over sixty years. She was pre-deceased by her husband Alan, a daughter Nancy, her brothers Bruce and Norman. She leaves her children and spouses: Brian (Bonny), Sheelagh Anderson (Bob), Ian (Lynne), Jim (Jane), John (Janine), sixteen grandchildren and three great grandchildren. The family is grateful to all staff at the Canterbury Manor and the Norwood Hospice for their compassionate and tender care of Audrey during the last six months of her life. A Funeral Service will be held at 2:00 PM, Thursday, August 18t, 2016, at Christ Church, 12116 - 102 Avenue NW. A reception will follow in the church hall with a private family interment thereafter. Donations in memory of Audrey may be made to the Salvation Army, 9618 101A Avenue NW, Edmonton, AB, T5H 0C7.